The search for a missing peacock is on in Springfield, Vermont. Pea, a 1 1/2-year-old peacock, has gone missing. 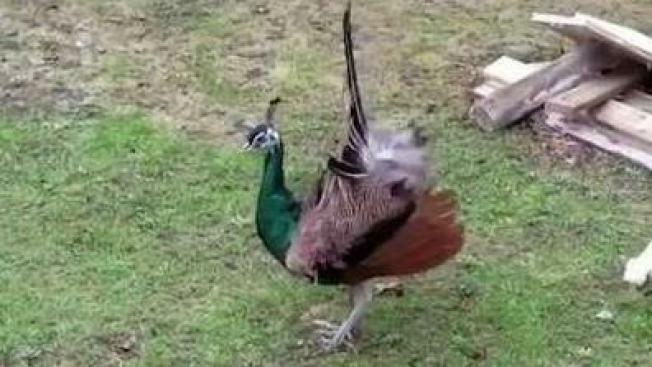 According to Rene Johnson, Pea's owner in Springfield, Vermont, the peacock recently ran off with a flock of turkeys. Johnson, who has owned Pea since he was two months old, said that Pea recently lost his fellow peacock friend, Lemon, who died in September -- and that may have caused him to take off. He usually hangs with other chickens, Johnson said, but Pea has been on the run for six weeks. Johnson said she has seen Pea, as have other neighbors and hunters, but no one has been able to capture Pea and return him home. Johnson set up a tent and is hoping the feed will be able to lure Pea back. She's owned other peacocks in the past, but Pea is different. Whereas the other peacocks would let you hold them, Pea is a "sassy teen," Johnson said.